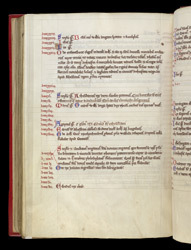 This manuscript consists of two parts: the first is a chronicle by William of Malmesbury (died 1143); and the second is a series of annals--with a particular emphasis on Bury St. Edmunds--as far as the year 1212, with subsequent additions. The manuscript was therefore almost certainly written at Bury in 1212. Half way down this page, the annal for 946 records that Agapitus became pope in that year. On the same line is an addition in larger, less formal script, in paler ink, which records the death of the 'glorious king Edmund, brother of Aethelstan' .